With the release of Apple’s iPhone 3G and its new iPhone 2.0 software, the hype and the lines are back, but the era of iPhone 1.0 is officially over. Those who waited for the second edition of the iPhone will appreciate dramatically faster cellular data access and an impressive software update including a raft of third-party programs. For original iPhone buyers, however, the iPhone 3G is only a must-have upgrade for those who will take full advantage of the fast 3G data network. At a casual glance, the iPhone 3G looks just like the original iPhone. Front and center is its bright, beautiful high-resolution 3.5-inch diagonal touch screen, offering a resolution of 480-by-320 pixels. It’s only when you look at both models side by side that you notice the face of the iPhone 3G is slightly wider, allowing a bit more black space between the sides of the screen and the chrome frame. On the bottom, the black speaker and microphone grilles of old have been replaced by two oval cut-outs with recessed silver grilles. Between the grilles and the iPhone 3G’s dock connector are two recessed Philips screws. It’s not every day that you find an Apple product, especially a slick consumer-electronics product, that’s got visible screws. At the top, the most obvious change is the replacement of original iPhone’s recessed headphone jack—which required the use of an adapter in order to attach most non-Apple headphones—with one that lies flat. That recessed jack was one of the most ridiculous design decisions in the original iPhone, and it’s great to see that Apple has addressed the problem and made the iPhone 3G accessible to just about any set of headphones in existence. The iPhone 3G’s left side includes a volume rocker switch and a sliding switch to place the phone into silent/vibrate mode, just like its predecessor. These buttons, as well as the Sleep button on the phone’s top, are now made of metal rather than black plastic. While they’re a pretty silver color, the metal edges are also much sharper than the original iPhone’s plastic ones, and they press uncomfortably into my fingers as I’m using them. I also found the iPhone 3G’s Vibrate switch to be more difficult to slide than the original model’s, though that extra resistance does mean it’s less likely that your phone will slip into or out of silent mode by accident. Although it’s more curved (and therefore thinner) than the original iPhone at its edges, it’s slightly thicker in the middle. However, your hand curves to hold the phone (unless you’ve got really small hands), and that curve is where the extra thickness is, making it undetectable. 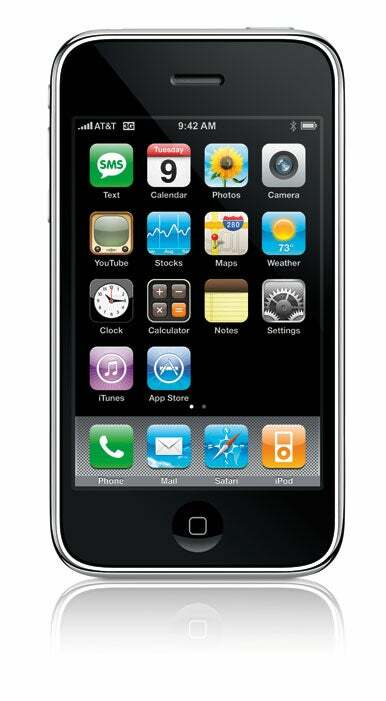 Apple truly designed the iPhone 3G to feel identical to the original iPhone. The iPhone 3G’s back is curved shiny plastic (available in black or, in the 16GB model, black or white), rather than the flat matte aluminum of the original model. Whether that’s better or worse is a personal, aesthetic choice, although the plastic case shouldn’t block radio signals as much as the aluminum did. However, the shiny plastic is much more adept at collecting fingerprints and smudges than the old textured aluminum. The curved back does make the iPhone 3G slightly unstable when laid on a flat surface, but it only wobbles slightly, and I found it acceptably stable for typing and tapping. There’s a gap between the sides of the iPhone’s display and the edge of the phone itself, making it unlikely that you’d touch close enough the edge to cause the phone to wobble dramatically. The extra width also makes typing on the iPhone with two thumbs slightly more comfortable by giving the thumbs a bit more room on which to roam. I don’t know if my thumb typing was any more accurate on the new phone, but it was certainly more comfortable to thumb-type on the iPhone 3G than on the original model. It’s always hard to judge a brand-new product when it comes to issues of durability, since we only have a few days to test the product and it’s very hard to short-circuit the test of time. However, our colleagues at PC World chose to sacrifice an iPhone 3G in order to see how rugged the product was. Although PC World’s iPhone 3G did end up completely shattered, the editors who tortured it were mightily impressed with its durability. The iPhone 3G survived several simulated trips through a pocket full of keys and other sharp objects, withstood being dunked in a bowl of cereal and milk, and even kept on working through a few drops on concrete from five feet up. The iPhone 3G’s glass screen cracked beyond repair on the fifth drop. The moral of this story: the iPhone 3G is pretty tough, but don’t use it to play a game of catch in a parking lot. Although this review is supposed to focus on the iPhone 3G as a hardware product, it’s impossible to fully separate it from the software it runs. The iPhone 3G ships with version 2.0 of the software that powers both the iPhone and its non-phone cousin, the iPod touch. This new version adds numerous features not present in the previous iPhone until now, including support for push email, contacts, and calendars via a corporate Microsoft Exchange server or Apple’s new MobileMe service. The most impressive feature of this new software is the App Store, which allows users to download programs written by software developers outside of Apple. The 2.0 software is, in many ways, the most important feature of the iPhone 3G. And it’s excellent. However, because that software is also available for the original iPhone and (as a $10 upgrade) the iPod touch, we’ve chosen to review it separately from the iPhone 3G hardware—that review will appear on Macworld.com later this week. What puts the iPhone 3G head and shoulders above the original iPhone is the addition of support for 3G networking. The third-generation wireless network that gives the iPhone 3G its name is much faster than the EDGE network. If you’re in an area with 3G network coverage, you’ll find that the iPhone 3G’s Internet connection is quite fast. In our tests, an iPhone 3G on AT&T’s 3G network downloaded media files and loaded Web pages between two and four times as fast as an original iPhone on AT&T’s EDGE network. Of course, not even the 3G cellular network can match up with pure Wi-Fi. For example, downloading a 1MB MP3 file took 87 seconds on EDGE, 21 seconds on 3G, and only 8 seconds via Wi-Fi. Best results in bold. Discontinued reference model in italics. More impressive than the raw download speeds is the fact that they enable Internet features that simply weren’t practical on the slower EDGE network. I was able to walk through downtown San Francisco, listening to a radio station streamed over the 3G network by the free AOL Radio program I downloaded from the App Store. Similarly, I could watch Major League Baseball video highlights downloaded by the MLB At Bat application, also downloaded over the fast network. Phones on the 3G cellular network also have the capability to download data and make voice phone calls simultaneously. On the previous model of the iPhone, you couldn’t talk on the phone while downloading data over the phone’s cellular data connection. But if the iPhone 3G is on a 3G network, you can talk and check Google Maps simultaneously without trouble. One downside of the 3G network is that using it drains the iPhone 3G’s battery more than the slower EDGE network. However, if you’re worried about running out of juice, Apple has provided an option (Settings -> General -> Network -> Enable 3G) so that you can turn off 3G networking. Once 3G is disabled, the iPhone 3G uses the same 2G network as its predecessor. As far as I can tell, the iPhone 3G is “faster” than the original iPhone solely because of the access it has to a faster cellular network. On Wi-Fi and EDGE connections the phones seem to be about the same speed, and taxing games such as FreeVerse’s Wingnuts Moto Racer appear to perform the same on both devices.